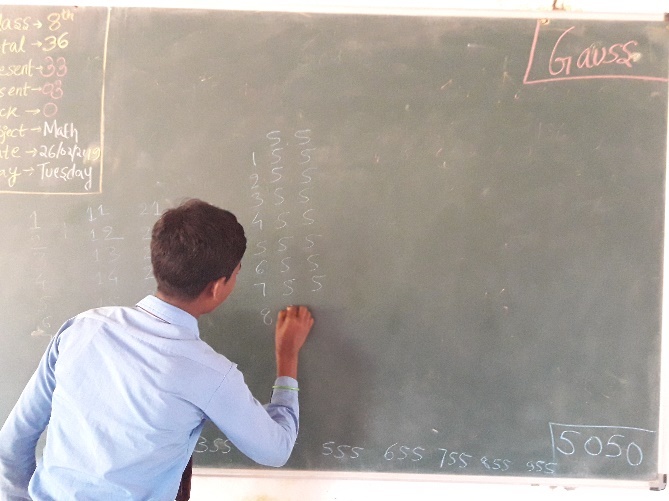 As an elementary student he amazed his teacher by quickly finding the sum of the integers from 1 to 100. Gauss recognized he had fifty pairs of numbers when he added the first and last number in the series, the second and second-last number in the series, and so on. For example: (1 + 100), (2 + 99), (3 + 98), . . . , and each pair has a sum of 101. Indeed a genius, Karl Friedrich Gauss is also known to be a child prodigy, growing up to become one of the greatest mathematicians and a physicist. Now as a mathematics teacher I look forward to experience such Gaussian things in my classroom. I search for greatness of human mind. And so, I keep telling the legendary tales of great people’s childhood. Even though many a times these stories could be entirely made up. Yet they are important because it awakens the spirit and inspires us. So, I told Gauss’ story and gave the exact same task to my 8th grade students. The task to add up all numbers from 1 to 100. The story had already sparked their minds and they instantly jumped to find the sum. Now if you try to just keep adding, in a few moments you’ll realize that there must be an intelligent and faster way. I mean it’s mathematics. It has to be interesting. Most of my children when started adding realized that it is too tiring and there has to be a better way and thus, they began to think. Magically, just in a minute, a child shouted 10,100. The answer is wrong but I guess he is extremely close because the answer he gave is just the double of the correct answer. 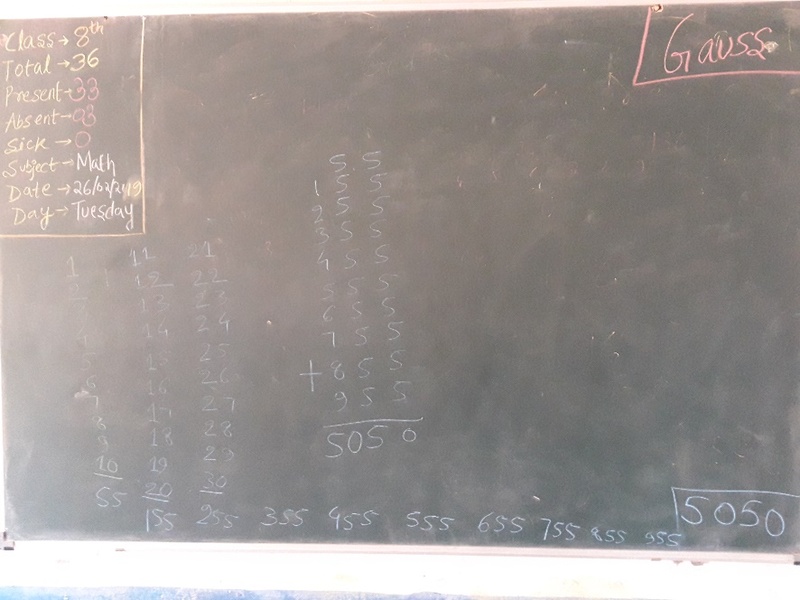 The next minute, another child shouted 5050. This child got it. In just less than 2 minutes. Adding 1 to 10, you get 55. Adding 11 to 20, you get 155. Adding 21 to 30, you get 255. Each time there is an increase of 100. Hence you need to add 55, 155, 255…..955 and you get 5050, the right answer. Now I know that this is no genius but for a child, finding that beautiful pattern and solving the problem in just less than 2 minutes is a great achievement. This kind of search for beauty in mathematics and winning over a problem sows the seed of love for mathematics. For me too, it is a moment to cherish as I could see children thinking and not just thinking but thinking mathematically. There are no formulas used or processes followed. Pure magic. There could be an apprehension that how could we say that the pattern is correct? Well it’s just easy arithmetic. The pattern is definitely correct. It is great that the child found it. But still he did a lot of addition i.e. 55+155+255+……955. The child could have delved deeper into the numbers in the pattern. Like, when you add 1 to 10, you get 55. When you add 11 to 20, you get 100+55. When you add 21 to 30, you get 200+55 and so on…. till 900+55 . Hence you get 55, ten times i.e. 55x10=550. And you get 100+200+300+…..900. Since 1+2+3+4+5+6+7+8+9=45, hence 100+200+300+…..900=4500. So the total would be 4500+550=5050. This way you can decrease both the addition and time to get the answer. The method may not be as ingenious as Gauss’ method. But for the class it was a mind-blowing revelation that we all can think creatively in mathematics just like Gauss did and amaze our friends and teachers. At least we can believe that we can even thought it might be impossible. When the explaination has been completed, another child said that he was thinking in the similar lines. I asked him why he didn’t tell me or anyone in the class? He said that he wasn’t sure of himself. I told him that all great mathematics has to come in the light otherwise it might die. The mathematician has to do it. It is a supreme responsibility. I added briefly about Ramanujan. Imagine if Hardy hadn’t discovered Ramanujan. What would have happened to his work? Would we even talk about him in this class today? It is important that you find the beauty but more importantly you have to share the beauty. Now the question is about the first child who came up with the answer 10100. What was his approach?